After originally seeing The Dark Knight, I really wanted to create a collage-style drawing. Thought up a few designs/concepts for a bit and, instead of having just Joker vs Batman, I decided to base it on the four characters fighting for Gotham City. you drew this?!?!!?!? holy mackerel,this is epic. omg!!!!!!!!! thats amazing!!!!!!!!!!! your hero pictures are really good, your pictures got recomended to me by a friend (S.T.A.N.Z.I.E. ), you're really tallented!! I love the concept. You're very talented. I'm humbled by your kind words! wow you're a freaking monster with colored pencils.. what size paper is this? This is really impressive! So detailled... It's perfect. What is the size of the original drawing? What is a copic marker? OMG!!!!!!!!! Okay you are so scary good. Very impressive. AWESOME. very reminiscent of the posters that are done for the star wars movies. was that an inspiration for you on this piece? in 50 years you can sell this for 3000 dollars!! Omg this looks freaking awesome!!! how you put the white color? 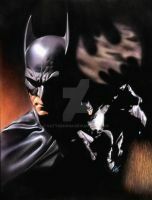 One of the best Dark Knight images I've seen, reminds me of Star Wars posters as well, definate ! Way to use colored pencil. Great. What do you use to color with?